Many of our lifestyle choices cause the skin surrounding the eyes to deteriorate over time. Dark circles, fine lines and puffiness are results of our daily lifestyle choices. These are all too often the first sign of premature aging. In this day and age, most of us spend most hours in the front of smartphones, laptops and tablet screens. Whether it’s for leisure or for work, we’re always at the mercy of our gadgets. Unfortunately, this has harmful effects on our eyes and the skin surrounding them. Outdoor activities like hiking and going to the beach, are good for your health but, can also be detrimental to the skin surrounding your eyes. As many studies show, too much exposure to direct sunlight can also harm skin and age it faster. Staying up late is never advisable if your goal is to achieve radiant-looking skin under your eyes. Too many late nights causes dark circles and these can make you seem older than you actually are. Drinking and smoking also contribute to skin aging. These poor lifestyle habits are all contribute towards prematurely older-looking skin. On top of all that, there is the dust and pollution all over the city. This does not help your skin at all, and only serves to age it even faster. All of these together result in dark circles, fine lines and puffiness around the eyes – all of which are effects of our lifestyle choices. To counteract the negative effects of the innumerable variables that contribute to skin aging, there is ARTISTRY HYDRA-VTM Refreshing Eye Gel Cream. 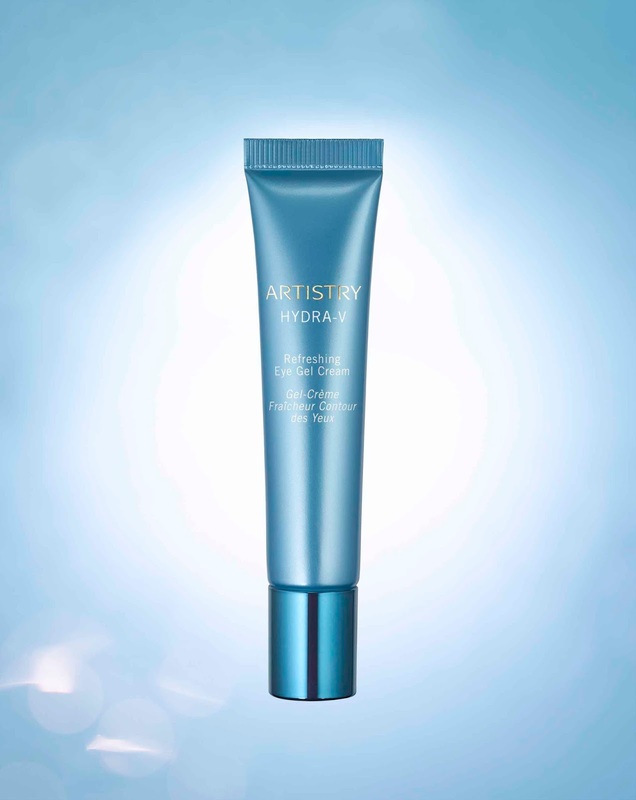 ARTISTRY HYDRA-VTM Refreshing Eye Gel Cream refreshes and hydrates the eye area to keep skin young and healthy-looking. It is made with a lightweight, silky-feeling gel formula that smoothly glides over the skin and is absorbed immediately along with all its benefits. It is also suitable for any skin type. More than that, ARTISTRY HYDRA-VTM Refreshing Eye Gel Cream contains special ingredients to ensure effectiveness. It encapsulates fresh Norwegian fjord water, which enables the product to rejuvenate the skin and lighten dark under-eye circles. It also contains a patented combination of Linseed and Licorice extract to relieve discomfort and remove puffiness caused by some of our daily activities. Finally, it possesses Centella Asiatica and Orange extracts to help improve the texture of the skin for an over-all healthy look. Just apply a pea-size amount of the product to the skin surrounding your eyes daily for best results. Because of its packaging, you can take it with you wherever you go and apply it to refresh tired-looking eyes. With ARTISTRY HYDRA-VTM Refreshing Eye Gel Cream you are assured that the skin around your eye is properly nourished, cared for, and youthful-looking. ARTISTRY HYDRA-VTM Refreshing Eye Gel Cream is exclusively distributed by Amway Philippines. Amway is a $9.5 billion direct selling business based in Ada, Michigan, USA. Top-selling brands for Amway are NUTRILITE™ vitamin, mineral and dietary supplements, ARTISTRY™ skincare and color cosmetics, and eSpring™ water treatment systems – all sold exclusively by Amway Business Owners. Global sales in 2015 made Amway the #1 direct selling business in the world, according to the Direct Selling News 2016 Global 100. For company news, visit globalnews.amway.com. I'm a smoker, a drunkard, and addicted to using computers. Wonder if this product will have an effect on me tee hee!!! You'll see the effect if you really are doing something for a change on your skin. You may use this but you need to sacrifice something in return as well like saving your skin from stress, too much computer will cause you staying very late at night. If you're willing to do that, then it might have an effect on you. I've never tried eye creams before.Wish I had tge time and energy to put them on.These days I just wash my face, put on a toner abd go to bed. Currently not using eye cream too because of my pregnancy. Some ingredients in eye cream can harm my situation so I skipped it totally. They say eyes is the reflection of one's soul. I believe we should keep it healthy and away from any harmful chemicals to retain ita beauty. Eye creams may do the trick to keep them looking fresh and stressfree. Yes, but still we should take care of it properly by eating fruits and veggies and avoid staying late at night or scrubbing it. Thanks for sharing this, I've been looking for an eye cream to get rid of puffiness. Have you tried this yourself and do you have like before and after pics? Nope, but I think this will be sent to me for review. I badly need this!!! Facing the computer 9-10 hours a day is so stressful so this product would really help! That's a lot. Does your work require you that? I wonder what is in a Norwegian fjord water that can rejuvenate skin and lighten dark circles. And I'm surprised that they patented the combination of linseed and licorice. Anyway, the benefits look nice and interesting :) I would have to do a deeper research on this first before I try it out. I didn't got your comment on the first part. Anyway, I hope you look into it more. I'm facing my laptop almost half my day on a daily basis because of work. I'm aware how it can contribute to skin aging so as much as possible, I apply sunscreen everyday even at home or in any indoor places. But this products looks very helpful to prevent early skin aging. As it claim it is, I really think this prevents aging. I hope to try it soon! It's not a review though. It's more of introducing the product first. I haven't even tried it myself. Note: This is not a review. Hopefully the sample for review will be sent soon. Eye Secrets Upper Eyelid Lifter is transparent however you can use makeup right excessive of the tapes.